By the early part of 1961 the Studebaker company was in financial peril. Things hadn't gone well for them since the end of World War II and sales of the little Lark were about the only things keeping them afloat. The Board of Directors hired Sherwood Egbert, formerly head of McCulloch Corporation, to take over the struggling Studebaker-Packard company and bring it into competition with the Big Three. Egbert loved fast cars and even though the Studebaker name was synonymous with value and tradition he managed to convince the board that a sleek performance car would save the company. The board agreed and Egbert went to his acquaintance, Raymond Loewy, for the design of the new car. Loewy, one of the 20th Century's greatest industrial designers (Coke bottle, refrigerators, etc.) gathered together several of his assistants and came up with a working set of drawings in two weeks. The new car would be called the Avanti. 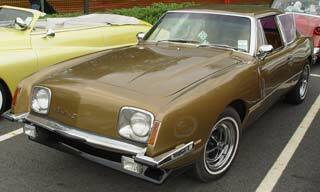 There wasn't any money available for the new Avanti, so the entire car was put onto a slightly modified Lark chassis. The body would have to be made of fiberglass, since metal stamping tooling was financially out of the question. At first the bodies were made by the Molded Fiberglass Products Company in Ashtabula, Ohio, but fit-and-finish problems (along with the fact that Corvette bodies were made there) forced Studebaker to move the production to its South Bend Indiana headquarters. Meanwhile, dealers were taking orders for the already-announced Avanti. Unfortunately the move of the body production and other, myriad technical problems caused long delays. This resulted in most of the orders being cancelled by the time the Avanti came out. Egbert wanted the Avanti to have the best performance in the industry. However, the lack of money dictated that no new engine could be developed. The same V8 that was first introduced in 1951 had to be upgraded for the Avanti, so Egbert told his engineers that it had to be strengthened to accommodate a supercharger. The engine's displacement was settled at 289 cubic inches. Using a 4-barrel carburetor the gross horsepower was 225, but with higher compression and a hotter cam it was raised to 240. The same Paxton supercharger from the '57-58 Golden Hawks brought the power output to 289 horsepower, designated as the R2. Underneath the car sat the ho-hum Lark suspension. To it was added a rear sway bar and radius rods and front disc brakes from Dunlop. A roll bar was fitted to the frame as well. In an era when Chevy and Ford was producing full-sized cars with over 400 horsepower engines the Avanti's measly little 289 didn't sound like much. However, the aerodynamically-slippery Avanti body and relatively light weight allowed the car to attain very impressive top speeds. A well-tuned R2 Avanti could do over 150 mph, earning it the reputation as "the world's fastest production car" by Car and Driver in 1962. There are persistent anecdotal stories out there that claim production Avanti's could do 170 mph, but that's because Andy Granatelli managed to do so in a specially-prepared car that had much more horsepower than the stock R2. His car's engine was dubbed the R3 and was to be made available to the buying public but less than 10 were ever sold. The reason was the price, unfortunately. At $6,000 virtually no one wanted one. Say what you will, but the Avanti was a daring and innovative car for its time. Studebaker managed to produce a "European" sports coupe that looked great inside and out. They were reliable, fast and instantly recognizable by the motoring public, but they didn't save the day for the Studebaker company. By December 1963 the Indiana plant was shut down and Lark production moved to Canada for a little while longer. Studebaker slid into automotive history. Absolutely! 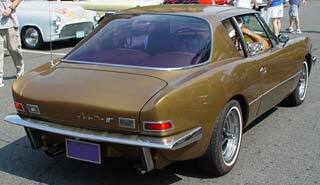 Avanti cars go for around $20,000 when restored and good candidates for restoration go for $3-5,000. They can't rust (the bodies, anyway) and parts are easy to find.